The Aquarium on Roanoke Island hosts the largest shark collection in North Carolina. Roanoke Island, and its town of Manteo, was home to the first English settlers that arrived in North America. Historically recognized as the birthplace of the first English child and the mystery of the Lost Colony, the island offers exciting sights for everyone to enjoy. The most recognized area of Roanoke Island is Manteo, NC. The Town of Manteo offers a delightful waterfront area with galleries, antiques, restaurants, boutiques, souvenir stores, ice cream shops, and more. Roanoke Island Festival Park is a 25-acre, history-filled park that provides families the opportunity to explore a replica of one of the first English ships, meet English interpreters and tour the museum and during the spring and summer months, live music is offered at this venue and makes for perfect summer afternoons. First Fridays is also held in downtown Manteo, where music, art, and face painting makes for great afternoons the whole family can enjoy. Located on the north-end of Roanoke Island, the Fort Raleigh National Historic Site preserves known portions of England’s first New World Settlements and the gorgeous Elizabethan Gardens were built in honor of Queen Elizabeth during her reign. Both areas are located on the same grounds and admission costs are very low to visit both. America’s longest running outdoor drama, The Lost Colony, is located at Manteo’s Waterside Theater also on Roanoke Island. The performance retells the story of the first English settlers to land in the New World and is sure to delight kids and adults of all ages with its captivating presentation. 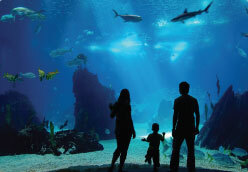 Another great must-see on Roanoke Island is the NC Aquarium. From live animal encounters and ecological displays, to the largest shark collection in the state, this inexpensive afternoon will amuse all members of your group and is a great way to start your day on Roanoke Island. While offering great historical sites, Manteo also offers vast recreational activities. Charter a fishing boat for a half or full day out of Pirate’s Cove or Thicket Lump; as both marinas cater to novice to experienced anglers. The island also offers scuba diving and spear-fishing equipment, kayak and bike rentals, dolphin tours, and the original OBX movie theater that still offers dollar movie admissions. Sun Realty is proud to represent OBX vacation rentals that are well-within driving distance to Roanoke Island and the Town of Manteo. Properties offered by Sun Realty range in size and are able to accommodate small and large family groups.